some of you may already know that i have a perverse love affair with print. my first real trade was in pre-press, when you still exposed film and the pdf was just being born. i still go a bit ga-ga over print-type things, am loving mr brown’s new print-focused blog and this year am hoping to do a few print workshops with the kraft kuties and hopefully hang out with the boys and girls at big fag press. 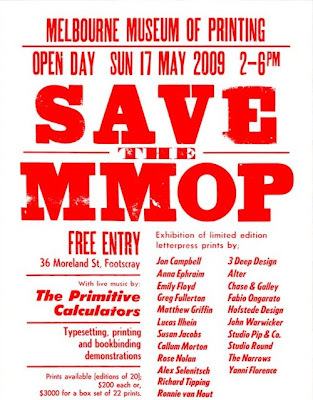 anyway, this weekend the melbourne museum of print (which is in scary danger of closing down) is having an open day with limited edition prints for sale, print/bookbinding demos, bands playing and free entry. in the words of bill and/or ted, it will be totally non-non-non heinous. i’m going to go, in between a squishy schedule of new process works, and i expect to see you all there. Next PostNext using a fashion device.